Crocheted Collar by Emma from Lulu Loves – I cannot express how much I LOVE this pattern. I made one of these for my daughter less than a month ago, it was so addictive I’ve made several since – I don’t even know any other little girls who I can give them to. You can experiment with different colours and sizes and match them with funky little buttons. 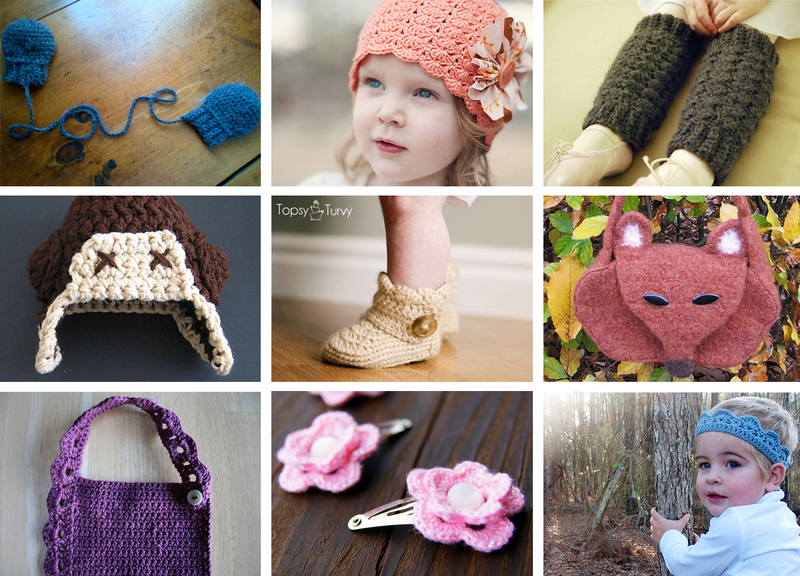 You can make one for your little girl and even a matching one for yourself! And people say I don’t get out enough. You can find the free pattern from this multi-talented lady over —-> here. Marshmallow Mittens by Jennette Reid – Every baby needs at least one pair of mittens, they’re great for keeping tiny little hands warm and toasty and they stop them from scratching. This would make an excellent baby shower gift. Little Sister Beanie by Linda Permann – One of my all-time favourites. Need I say more. Little Girl Easy Legwarmers from A Crafty House – These are great for the cooler weather. Plus they just look funky. Baby Aviator Hat by Deborah Bagley – One for all the aspiring aviators out there. Too cute! Fox Bag by Birgit Tüchsen – How cute is this? Of course it doesn’t have to be for a child, I definitely wouldn’t mind having one of these for myself. Ruffled Edge Bib by Alicia Bergin – (Almost all) baby bibs are universally ugly. Just because they are practical doesn’t mean they can’t be a bit pretty as well. Admittedly though, I would have a few trepidations about putting one of these on the neck of a toddler who’s just about to hoe into a gigantic bowl of spaghetti bolognese – not without a soaking bucket on hand at least. But they would be perfect for smaller, dryer snacks. Thread Crochet Flower Hair Clips by Connie Lee – What little girls jewelery box would be complete without the classic crocheted flower hair clip. Prince Charming Crown by Lindsay Haynie – Any little boy would look charming wearing one of these. I jumped for joy when I found this one, I’ve seen sooooo many crown patterns for little princesses we needed something for all the little princes out there too. Awesome! These are all super lovely. Can’t wait to try a few out.